The Trump administration ordered the EPA to take down its climate change page, according to Reuters. No, you don’t. Climate change is the most important issue facing the world today. It threatens the survival and well-being of everyone. Without the knowledge to understand it, we are helpless before the threats it poses. 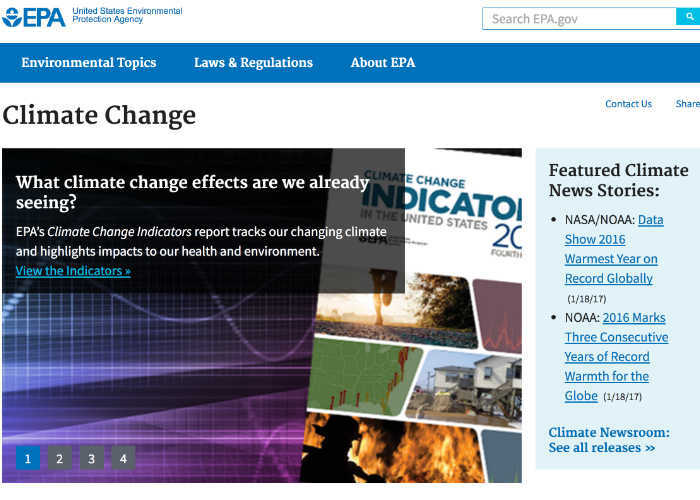 View my copy of the EPA climate change page here. The Earth doesn’t care about our project called civilization. We must maintain and change our cities and minds and technology and hopes — or watch nature bat them aside. Evolution cannot occur without information, and progress begins with awareness. Ignorance kills, and I for one want to live. It’s true that the internet does not need the EPA page to keep the facts flowing. But I believe it is important that my government knows that this issue cannot be buried or distorted for the sake of petty politics. Such oppressive decisions threaten all of us and our futures, and undermine the people, intellect and passion that have made this nation amazing. America, as flawed as it is, already is great, Trump, because it is a country that wants to solve its many problems, not pretend that they don’t exist for the sake of an ideological agenda. I’m saving this copy of the EPA page to counter the despondency I feel when I witness how the current top employee of America’s citizenry is using his immense, borrowed power. If you tell me you don’t believe in climate change, I’ll remind you that facts are not a matter of faith. Republican or Democrat, climate change believes in you. What are you going to do about it? PS — Do any developers know how to automate a way to make thorough and fully functional copies of any pages that are removed from government websites? It would be a great public service. Here is how to contact me. My emphasis is more on the implications of communication decisions and design, whereas the excellent Climate Mirror Project is taking on the task of copying climate change data.